DOT presented results from its 2015 and 2016 safety projects on Queens Boulevard last night at a public workshop for the fourth phase of the redesign, in Forest Hills. Traffic injuries have dropped 35 percent on the 2.5-mile stretch of Queens Boulevard that DOT first redesigned with more dedicated space for walking and biking. Pedestrian injuries have declined even more — 63 percent. About 100 people turned out to weigh in on the next section of the Queens Boulevard redesign, and overall they were enthusiastic about extending similar safety improvements east through Forest Hills. The average number of cyclist injuries increased, but the baseline was relatively low and subject to year-to-year fluctuations. 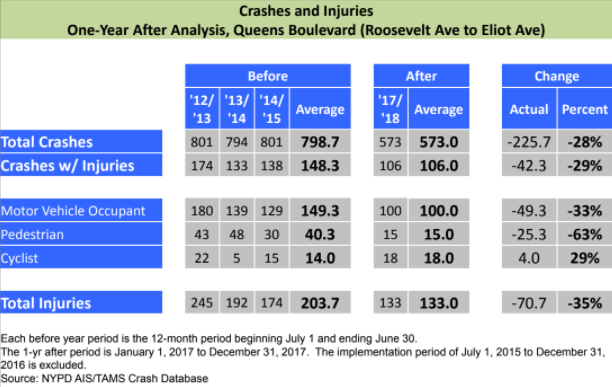 Assuming that more people are biking on the safer Queens Boulevard, the risk of injury per mile of cycling has likely been reduced. This year DOT is planning to redesign Queens Boulevard between Yellowstone Boulevard and Union Turnpike. Last night’s public workshop at Queens Borough Hall kicked off the design process. One of the participants was Rafael de Balanzo, who lives east of Yellowstone and just south of Queens Boulevard. He crosses Queens Boulevard every day, either by foot with his children or on his bike en route to work at Queens College. But he won’t bike on Queens Boulevard itself, and when he needs to get across with his kids, he prefers to do so underground, through a subway station tunnel. 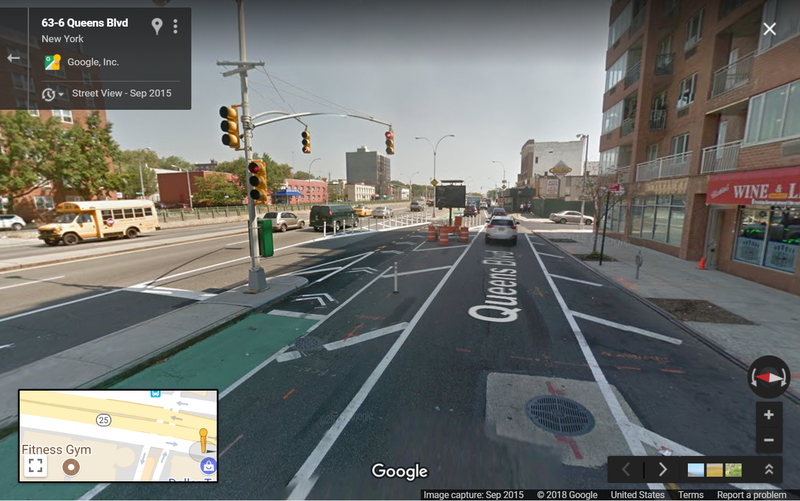 Local media attention on the Rego Park section of the redesign has recently focused on the conversion of car parking spots on the service roads to create dedicated space for biking and walking, and the handful of business owners who are upset. Some of those business owners came to the workshop to vent spleens, but overall, participants were focused on improving safety. People gathered at tables to discuss what’s not working on this part of Queens Boulevard and what they envision for the next phase of the redesign, then reported back to the whole group. By and large, they wanted the format of the first three phases to be extended. Ines Nedelcovic bikes to work in Manhattan via Grand Avenue and the Williamsburg Bridge, but she avoids riding on Queens Boulevard. “I take as many secondary and tertiary roads as I can, because Queens Boulevard intimidates me,” she said. Mark Laster, who sits on the Community Board 6 transportation committee, told Streetsblog he was satisfied with the redesign so far, and that it should be replicated in the fourth phase. DOT should bring along crash survivors to hammer home the dangers of our streets. Given this data, not to mention years of proof that these designs save lives, why do traffic calming projects have to be approved by community boards? DOT needs to be given the authority to move full steam ahead. Not if they don’t want to undermine their pro-crash agenda! Technically CBs only have an advisory role. At least one of the sections was done in spite of the CB rejecting the redesign. Amazingly enough, there’s an intersection on Queens Blvd that has a car leading interval on the light instead of a pedestrian leading interval. It’s amazing how terrible that street is. A friend of mine was crossing Queens Blvd and was struck by a left-turning van a few days ago. It is no coincidence that it is referred to as the boulevard of death. It is appalling how much road violence we accept. I went to a funeral a few years ago for someone who was t-boned and killed by a drunk driver. My grade school classmate and first crush was killed as a passenger in a car when the driver lost control of the vehicle. My cousin had her legs broken when she was hit by an inattentive driver. This is not the sort of thing that should be normal. Safety should always come before convenience. Enough is enough; Queens Blvd is in desperate need of safety enhancement. Yeah, which is why they shouldn’t even need to give a resolution in support of these projects. DOT should notify them as the law requires and that’s it. If the CB wants to hold a public forum where people gripe, fine, but it shouldn’t be on DOT to have to seek approval for something that’s proven to work. I’ve cycled on Queens Blvd. on and off for decades but I totally agree that prior to the safety improvements it wasn’t for the faint of heart. Crossing it on foot is even worse, to the point I’ll invariably opt to use a subway station as a defacto underpass if one is within a few blocks of where I need to cross. Community boards shouldn’t get to decide if we implement safety improvements on a street which is one of the few available through routes in northern Queens. It’s faster now, definitely less stressful, and its somewhat safer, only because you’re not riding in the driver’s blind spot anymore, so you don’t have to check behind you as much. A vehicle can still trespass into the lane, when someone double-parks, so I usually would straddle between the pedestrian zone and cycling lane. The slip lanes are now stop or signal controlled, but I don’t like how the cycle lane is oriented at those locations; I prefer to cross in front or behind a vehicle when those slip lanes (service rd to main rd) begin. Cycling through the BQE and LIE is a lot easier. The Queens Boulevard redesign is wonderful. The only flaw in it is the stoplight for bikes at 61st Street on the eastbound side. It is sooooo long. The result is that even those few cyclists who are inclined to stop at the red will tend not to wait the whole period. An excessively long red-light period is harmful, as this further erodes cyclists’ already low respect for traffic signals, and promotes behaviour that is dangerous both in terms of risking being hit by a car and in terms of exacerbating the existing public hostility towards bicyclists. Did these people bring any, you know, evidence? I don’t think I can recall a single time that this position was argued with actual evidence of anything. Good thought. However, it’s not a malfunctioning signal; the thing is operating the way it was intended. The disagreement That I have is on the policy level; and I doubt that 311 is the way to express that. You guys need to throttle back your comments. It’s hardly a “pro-crash agenda” to want community input. I understand the issue and I, too, would object to a traffic signal that gives cars a lead time instead of pedestrians and bikes. A sensible form of Vision Zero makes a ton of sense. But, when gung-ho city planners start eliminating needed auto lanes instead of trying to design modifications that will serve all three modes in a balanced way, there is plenty of reason to object. Safety is paramount, of course, but those figuring out new configurations need to keep in mind the statistics on actual crash causes and the fact that speed is not the only cause or the only issue. What ever happened to trying to work together to come up with streets that will serve all? A purely anti-car form of Vision Zero is hardly the ideal way to proceed. It’s community input undermines the motorsexual pro-crash agenda. Duh. Your extremist thinking shows you need to chill out and read what I wrote and think about it instead of just firing back verbal rounds from a very narrow point of view. Democracy is based on listening to others’ points of view and attempting to cooperatively develop solutions that take into account every aspect of a problem and find ways to accommodate everyone to the extent possible. You need a civics lesson, that’s for sure! We are in an age when proven street safety improvements still get stalled by parochial local concerns. It's an example of what the de Blasio administration can accomplish when it decides to take its public safety mandate seriously. Mayor de Blasio declined to commit to installing a protected bike lane — which is his own administration's plan — as part of the long-delayed final phase of the Queens Boulevard safety redesign.